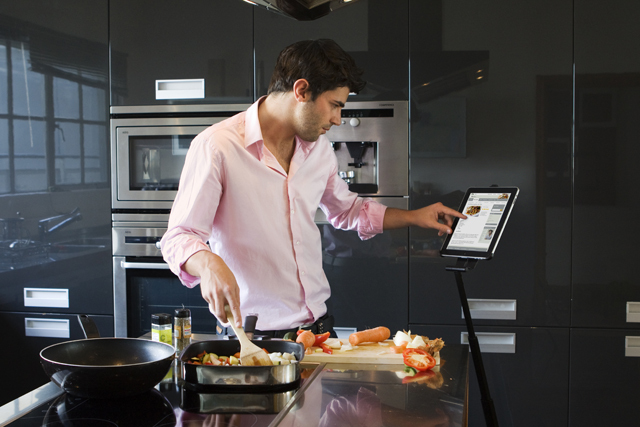 There are plenty of stands, wall mounts and balancing accessories available to make watching TV shows, following recipes or playing games even easier with your iPad. However, most seem to be geared up for one particular scenario and only let you bend and twist a certain way before you get fed up and end up trying to hold your iPad yourself, which could lead to nasty food spilling or even worse, bath-related incidents. Ouch. Well a new stand from R.A.T Music Stands called the Z3 will allow you to position your iPad at ANY angle ensuring easy viewing and a safe, scratch-free and water-free tablet. Now if you’re thinking the Z3 just looks like those metal sheet music stands you used at school, that’s because the manufacturers are the world’s leading designer and producer of professional music stands. Interesting, huh? Well they realised that their designs and technology could be used to keep other things in place, other than just music books. If you’re still not convinced (because let’s face it, it does look a bit dull), the stand is fully adjustable from 40cm, right up to 137cm so you can use it while lying down, sitting or standing, it’s got built-in swivelling capabilities, so you can turn it 360 degrees at any angle AND it folds into a neat bag in three simple steps. Although it’s probably great for meetings and giving presentations with your iPad, this means we can watch our favourite TV shows from the bath, which is the main reason it gets a big thumbs up from Shiny Shiny. Available from Firebox for £144.99. Is Instagram FINALLY coming to Android?